The electrocompressor's main components are: Air suction filter, compressor, electric motor, oil filter and cooler, air cooling system, electrical panel for power-on and adjustment, support base and elegant sound-proof casing. Particularly recommended for new or stand-alone installations where there is a need for compressed air with a low noise level. The unit consists of an electrocompressor on a fixed, 270/500-litre tank. Especially recommended for installations with compressed air demand with a low dew point. 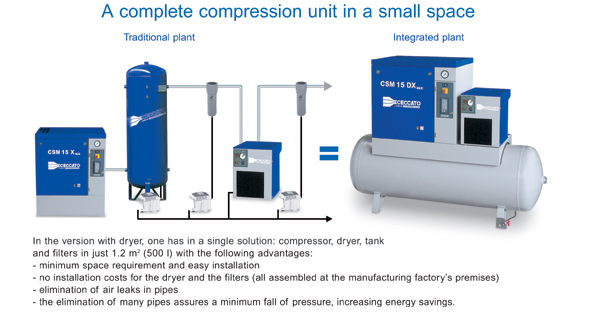 For compressed air demands without oil, CSM MAXI can be equipped with deoiling pre-filter and afterfilter + By-pass and centralised condensate drain.